"Al-Assad" redirects here. For other uses, see Asad. The al-Assad family (Arabic: عَائِلَة الْأَسَد‎ ʿāʾilah al-ʾAsad) has ruled Syria since Hafez al-Assad became President of Syria in 1971 and established an authoritarian government under the control of the Ba'ath Party. After his death in 2000, his son Bashar succeeded him. The Assads are originally from Qardaha, just east of Latakia in north-west Syria. They are members of the minority Alawite sect and belong to the Kalbiyya tribe. The family name Assad goes back to 1927, when Ali Sulayman (1875–1963) changed his last name to al-Assad, which means "the lion" in Arabic, possibly in connection with his social standing as a local mediator and his political activities. All members of the extended Assad family stem from Ali Sulayman and his second wife Naissa, who came from a village in the An-Nusayriyah Mountains. 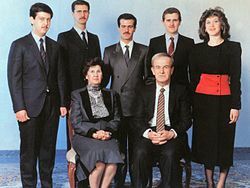 The Assad family originates from Sulayman al-Wahhish, Hafez Assad's grandfather, who lived in the northern Syrian mountains in the village of Qardaha. The locals reportedly nicknamed him "Wahhish", which means "wild beast" in Arabic, because he was physically strong and a good fighter. Al-Wahhish remained the family name until the 1920s when it was changed to al-Assad which means "lion" in Arabic. Because of Sulayman's reported strength and marksmanship, he was respected in his village. At the outbreak of the World War I, the Ottoman governor of the Aleppo Vilayet sent troops to the area to collect taxes and round up recruits. The troops reportedly were fought off by Sulayman and his friends who were only armed with sabres and old muskets. Because Sulayman was respected, he was a local mediator between quarreling families. He was also one of the local chieftains who were the de facto rulers of the area. The chieftains from the powerful families would provide protection to their neighbours and in return they gained loyalty and respect. Hafez al-Assad's father Ali Sulayman al-Assad, who was born in 1875, inherited many similar characteristics of his own father and became well-respected among the locals. For his accomplishments, he was called al-Assad, the lion, by the locals. He made his nickname a surname in 1927. He lived until 1963, long enough to see his son's rise to power. He married twice and over three decades had eleven children. His first wife Sa'ada was from the district of Haffeh. They had three sons and two daughters. His second wife was Na'isa, twenty years younger than him. She was the daughter of Uthman Abbud from the village of Al-Qutailibiyah, a dozen kilometres further up the mountain. They had a daughter and five sons. Hafez was born on 6 October 1930 and was the fourth child. Al-Assad family religion is Islam, more specifically Alawite. Despite being Alawite with the Syrian Civil War ongoing, part of the Alawite community is starting to distance themselves from the Al-Assad government. Anisa Makhlouf (1930–2016), wife of Hafez and First Lady. Gen. Assef Shawkat (1950–2012), was deputy-chief of staff of the Syrian army and the former head of military intelligence. He was killed on 18 July 2012 in a bombing in Damascus, during the Syrian Civil War. Majid al-Assad (1966–2009), was an electrical engineer with a reported history of severe mental problems. Died after a long, unspecified illness. He was married to Ru’a Ayyoub (born 1976) and had no children. Majid died in Damascus on December 12, 2009. Maher al-Assad (born 1967), is the commander of the Republican Guard, which are also known as the Presidential Guard, and the army's elite Fourth Armored Division, which together with Syria's secret police form the core of the country's security forces. He is also a member of the Ba'ath Party central command and is said to have an aggressive and uncontrollable personality. He is married and has two daughters. He is reported to have been severely disabled in a 2012 bombing in Damascus during the Syrian Civil War. He reportedly shot Assef Shawkat in the stomach in October 1999, during an argument. Maher is also known by many to be the most ruthless in the Al-Assad family. 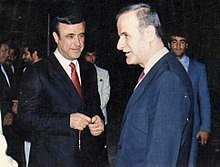 Jamil al-Assad (1932–2004), parliamentarian and commander of a minor militia. Politically marginalized years before his death. Suleiman al-Assad, Hilal's son, was arrested in August 2015 after allegedly murdering an off-duty colonel in a 'road rage' incident in Latakia. Muhammad Tawfiq al-Assad, another leader of the "Struggle companies". He was killed in a dispute with a powerful person over control in the al-Qerdaha area of Latakia province, on March 14, 2015. Hussein Tawfiq al-Assad, son of Muhammed. He took over the criminal network of his father and reorganized it into a paramilitary unit, the Lions of Hussein. ^ Eyal Zisser (2004). "Bashar al-Asad and his Regime – Between Continuity and Change". Orient. Retrieved 2 April 2011. ^ McConville, Patrick Seale with the assistance of Maureen (1990). Asad of Syria: The Struggle For The Middle East. Berkeley: University of California Press. p. 9. ISBN 978-0-520-06976-3. ^ Robin Wright (22 February 2008). "Sanctions on Businessman Target Syria's Inner Sanctum". The Washington Post. Retrieved 31 March 2010. ^ a b c d e Bar, Shmuel (2006). "Bashar's Syria: The Regime and its Strategic Worldview" (PDF). Comparative Strategy. 25: 380. doi:10.1080/01495930601105412. Archived from the original (PDF) on 23 July 2011. Retrieved 15 May 2011. ^ "Syrian Alawites: Their history, their future - The Islamic Monthly". theislamicmonthly.com. 28 October 2015. Retrieved 28 March 2018. ^ "Council Implementing Decision". European Union. Retrieved 21 January 2013. ^ Mohamad Daoud (October 2006). "Dossier: Bushra Assad". Mideast Monitor. Archived from the original on 21 July 2011. Retrieved 2 April 2011. ^ "Cookies op AD.nl - AD.nl". www.ad.nl. Retrieved 28 March 2018. ^ William E. Schmidt (22 January 1994). "Asad's son killed in an auto crash". The New York Times. Retrieved 31 March 2011. ^ a b c d e Bar, Shmuel (2006). "Bashar's Syria: The Regime and its Strategic Worldview" (PDF). Comparative Strategy. 25: 379. doi:10.1080/01495930601105412. Archived from the original (PDF) on 23 July 2011. Retrieved 15 May 2011. ^ "SANA: Bashar al-Assads Youngest Brother Dead". iloubnan.info. 12 December 2010. Retrieved 3 April 2011. ^ "Syria's military: what does Assad have?". Reuters. 6 April 2011. Retrieved 5 May 2011. ^ a b c d e "COUNCIL DECISION 2011/273/CFSP of 9 May 2011 concerning restrictive measures against Syria". Official Journal of the European Union. L121/11. 10 May 2011. Retrieved 10 May 2011. ^ "Syria: Bashar al-Assad's brother Maher 'loses leg'". The Telegraph. London. 16 August 2012. Retrieved 16 August 2012. ^ "Assad's feared brother lost leg in bomb attack: sources". Reuters. 16 August 2012. Retrieved 16 August 2012. ^ CNN, By Brian Rokus and Brian Todd,. "Syrian Maher al-Assad is ruthless aide to brother Bashar, analysts say - CNN". cnn.com. Retrieved 28 March 2018. ^ a b c Landis, Joshua. "An Asad Arrested for Smuggling Weapons". Syria Comment. Retrieved 16 May 2011. ^ a b c d "COUNCIL IMPLEMENTING DECISION 2011/302/CFSP of 23 May 2011 implementing Decision 2011/273/CFSP concerning restrictive measures against Syria". Official Journal of the European Union. L136/91. 24 May 2011. Retrieved 25 May 2011. ^ "The Original Shabiha". Joshua Landis. 17 August 2012. Retrieved 21 January 2013. ^ a b c d e f g h i Bar, Shmuel (2006). "Bashar's Syria: The Regime and its Strategic Worldview" (PDF). Comparative Strategy. 25: 381. doi:10.1080/01495930601105412. Archived from the original (PDF) on 23 July 2011. Retrieved 15 May 2011. ^ a b Robert Fisk (16 September 2010). "Freedom, democracy and human rights in Syria – Ribal al-Assad gives our writer a rare insight into the dynasty that has shaped modern Syria". The Independent. Retrieved 3 April 2011. ^ a b Duelfer, Charles (30 September 2004). Comprehensive Report of the Special Advisor to the DCI on Iraq’s WMD (PDF). Central Intelligence Agency. pp. 103–104. Archived from the original (PDF) on 13 August 2011. Retrieved 16 May 2011. ^ a b c "Cable Viewer". Wikileaks. 2 January 2006. Retrieved 21 January 2013. ^ a b c Al Hendi, Ahed (3 May 2011). "The Structure of Syria's Repression". Foreign Affairs. Retrieved 5 May 2011. ^ "Alphabetical Listing of Specially Designated Nationals and Blocked Persons ("SDN List")". US Department of the Treasury. 31 March 2011. Retrieved 3 April 2011. ^ a b c "Council Implementing Regulation (EU) No 611/2011 of 23 June 2011 implementing Regulation(EU) No 442/2011 concerning restrictive measures in view of the situation in Syria". Official Journal of the European Union. L164/54. 24 June 2011. Retrieved 25 June 2011. ^ Bar, Shmuel (2006). "Bashar's Syria: The Regime and its Strategic Worldview" (PDF). Comparative Strategy. 25: 395. doi:10.1080/01495930601105412. Archived from the original (PDF) on 23 July 2011. Retrieved 15 May 2011. ^ "Biography for Riyad Shalish". Archived from the original on 12 March 2012. Retrieved 25 June 2011. ^ a b c d e Leverrier, Ignace (25 February 2012). "In Bashar al-Assad's Syria, the disinformation is also a family affair". Le Monde. Retrieved 8 March 2012. ^ "Alawites rally after 'Assad's cousin killed officer'". www.aljazeera.com. Retrieved 28 March 2018. ^ a b "Syria Comment » Archives » "The Original Shabiha," by Mohammad D". Joshualandis.com. 17 August 2012. Retrieved 21 January 2013. ^ Briscoe, Ivan; Floor Janssen Rosan Smits (November 2012). "Stability and economic recovery after Assad: key steps for Syria's post-conflict transition" (PDF). Clingendael: 1–51. Archived from the original (PDF) on 19 November 2012. Retrieved 7 March 2013. ^ Tim Lister, and Jamie Crawford (7 March 2012). "Meet Syria's wealthiest and most elusive man". CNN. Retrieved 28 March 2012. ^ "US embassy cables: US sought financial pressure on top Syrian officials". The Guardian. London. Wikileaks. 20 December 2010. Retrieved 16 May 2011. ^ a b Peel, Michael (27 April 2011). "Assad's Family Picked up by the West's Radar". Financial Times. Archived from the original on 21 January 2013. Retrieved 6 May 2011. ^ CNN, By Nicole Dow,. "Getting to know Syria's first family - CNN". cnn.com. Retrieved 28 March 2018. ^ "Bomb kills Syria defense minister, Assad's brother-in-law and key aides". Al Arabiya. 18 July 2012. Archived from the original on 19 July 2012. Retrieved 18 July 2012. ^ "Office of Foreign Assets Control: To List of Specially Designated Nationals and Blocked Persons" (PDF). Treasury Department. Retrieved 7 May 2011. ^ Shadid, Anthony (10 May 2011). "Syrian Elite to Fight Protests to 'the End'". The New York Times. Archived from the original on 13 May 2011. Retrieved 11 May 2011. ^ Trombetta, Lorenzo (27 April 2011). "Le sanzioni americane colpiscono i boss dell'apparato repressivo (American sanctions target the leaders of repression)". Europa. Archived from the original on 30 April 2011. Retrieved 9 May 2011. ^ "Biography for Atif Najib". Silobreaker. Able2Act. Archived from the original on 12 March 2012. Retrieved 17 May 2011. ^ "Cable Viewer". Wikileaks. 7 February 1994. Retrieved 21 January 2013. ^ Hugh Macleod; Annasofie Flamand (15 June 2012). "Inside Syria's shabiha death squads". Toronto Star. Retrieved 21 January 2013. ^ Seale, Patrick (1988). Asad of Syria: the struggle for the Middle East. University of California Press. p. 429. ISBN 0-520-06667-7. ^ AFP Al Arabiya News (14 March 2015). "Assad relative assassinated in Syria". Middle East: alarabiya.net. Retrieved 14 March 2014. ^ Vincent Beshara; Cody Roche (11 December 2016). "Assad Regime Militias and Shi'ite Jihadis in the Syrian Civil War". Bellingcat. Retrieved 11 January 2017. ^ a b Hanna Batatu (1999). Syria's Peasantry, the Descendants of Its Lesser Rural Notables, and Their Politics. Princeton University Press. p. 220. ISBN 978-0-691-00254-5. Retrieved 27 March 2013. ^ "Syria's Praetorian Guards: A Primer". Middle East Intelligence Bulletin. Vol. 2 No. 7 (5 August 2000). Retrieved 20 May 2011. Zahler, Kathy A. (2009). The Assads' Syria. Twenty-First Century Books. ISBN 9780822590958.